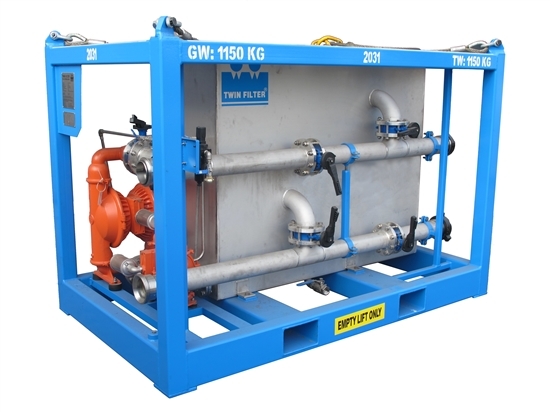 To operate a Filter Press you need a SLURRY SKID. Parker Hannifin (Twin Filter) can offer you two options; a single unit or a double unit. De single unit is the most economical option however the double unit offers several features and benefits. The two induvidual compartments of the double Slurry Skid unit operate seperately using one compartment for precoat and one for dosage. This alows easier operation and switch over and profides the possibility to operate two Filter Presses with one double unit, resulting in minimal down time. Slurry Skid with air bubbling agitation. Slurry Skid including body feed and pre-coat pump.